Despite a strong return to form against Colby and Bates, the football team was soundly defeated 33-3 by Little Three rival Amherst at home this weekend. 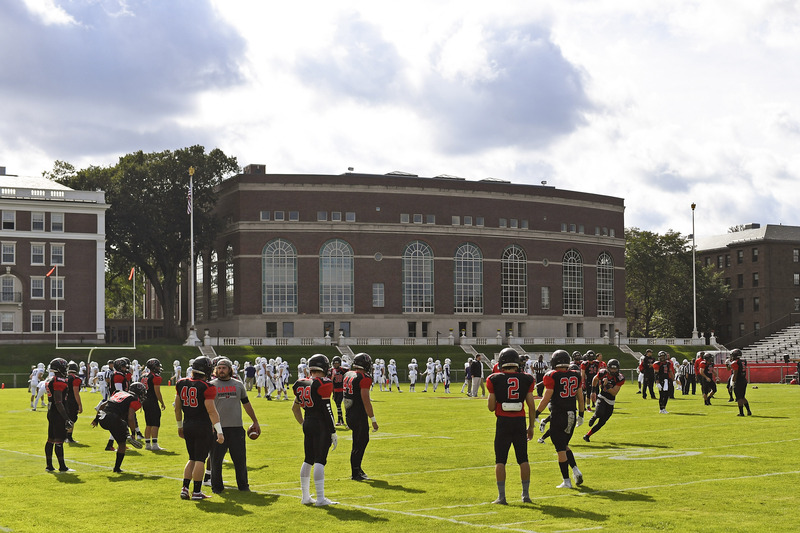 A disappointing performance on both sides of the ball puts Wesleyan out of contention for the NESCAC title or even competing for a top spot. However, the Birds can take some comfort that Amherst is the best team in the conference this year, so it is doubtful that Wes will face an opponent as difficult as Amherst again this season. That said, Wesleyan’s performance this week was weak. A third of Wesleyan first downs came from Amherst penalties, and Amherst had almost double the number of first downs. The offense managed a total of negative-three yards on the ground (despite 22 attempts) and only 104 through the air. In fact, Amherst had quadruple the offensive output and triple the average gain per offensive play. Nevertheless, Amherst’s strength was their defense. Six sacks and an interception are pretty good indicators of how thoroughly the Wes offense was snuffed out. However, it was not all bleak, as the Cardinals improved greatly in two areas that had been real weaknesses throughout the season. For one, the Red and Black massively improved their issue with discipline and penalties, giving up only four penalties throughout the game compared to Amherst’s nine or even the eight earned in the previous match against Bates. Special teams also greatly improved, as they managed to hold Amherst to only 50 punt return yards. Though this may seem high enough in itself, considering that Wesleyan punted seven times, it is far more impressive especially taking into account the previously lackluster special teams’ performances against much weaker opponents such as Colby or Hamilton. The game started off badly as Mark Piccirillo ’19 was sacked in the end zone for a safety on the first Wesleyan drive of the game. Amherst quickly scored again with a rushing touchdown, but the Cardinals were not intimidated and scored their only points of the game on the ensuing drive with a 41-yard field goal by Patrick Wolff ’21. The Red and Black defense could not quite hold back the Amherst offense, which was rolling up the field, as they kicked a 41-yard field goal to take the score up to 12-3 to start off the second quarter. The rest of the first half followed much of the same pattern with Amherst dominating on both sides of the ball as Wesleyan struggled to gain ground; however, just before the halftime whistle, Brandon Morris ’19 made one of the plays of the game with a forced fumble on the Wesleyan six-yard line to stop yet another score. The second half of the game was very similar with more Cardinal struggle and Amherst ease. The Mammoths cruised to an easy victory despite the Cards’ best efforts. The end of the season will be very tough, as both Williams and Trinity have put together strong seasons and are competing for the title. Trinity has the best offense in the conference, having scored 240 points so far this season with a strong defense capable of imposing their will on their opponent. Williams also has a strong defense, which they rely on heavily due to their shaky offensive performance, but they will also pose a great challenge to the fate of the Red and Black’s season. Luckily, Bowdoin has yet to win a game and has the worst defense in the conference. That matchup should be a nice break from the toughest part of the schedule. The men of the match are Morris and Wolff, who both gave it their all when their team needed them most. They stepped up to the plate and delivered, even if they were not quite enough to change the game.